Live from the Red Carpet! It’s your chance to have a red carpet kind of time! Ask each guest to go to GoodWill and buy a dress to wear to the party. 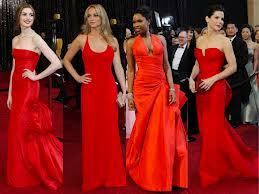 There are old prom dresses and special occasion dresses there to fit nearly every figure. Even the men can buy a dress to wear to the party. All of the GoodWill dresses can be donated back to the charity later and you have helped a good cause. When the guests arrive hand each person a ballot to pick the winners in the main Academy Awards categories. Keep the predictions. The person who gets the most correct wins a prize. At the party I heard of, the prize is a bunch of gift cards. You ask each guest or couple to bring a gift card of a certain amount to be part of the gift card prize. You could certainly give a different prize if you like. You might like to make your own runway film with commentary as each “star” models their dress and mugs for the camera. An interviewer (in the style of Joan Rivers?) can ask questions for this film also. If you have this party every year, you can enjoy previous years’ films of these interviews. I guarantee they will be more interesting than the ones on tv!